When our nutritionist, Laura, reviewed the Chicken Verde with Black Beans recipe, she shared how to reduce the saturated fat in spicy food recipes. Sometimes spicier foods needs some fat to make them tasty and reduce the heat. To achieve this, many spicy foods are covered in cheese. Our original recipe called for a full cup of pepper jack cheese, which holds 5.4g of saturated fat per serving. Laura adjusted the recipe, explaining how we can reduce the saturated fat and swap in a healthy fat – which is important for cholesterol levels. How? With avocado! By replacing some or all of the cheese with avocado or guacamole, one can eat a much healthier meal, while still enjoying spicy food. 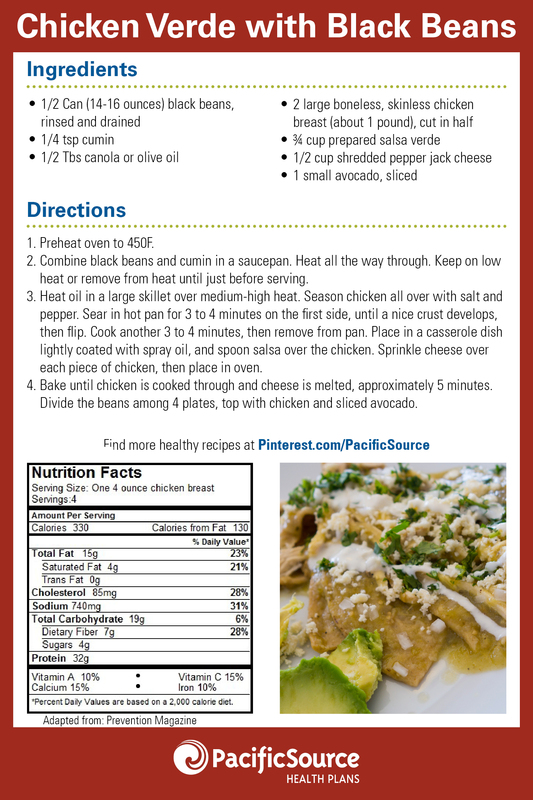 In the Chicken Verde recipe, this substitution reduced the saturated fat while adding another layer of flavor! PS: By replacing cheese with avocado, we also reduced the sodium in the recipe! I like using fat free or low fat greek yogurt as a substitute for cheese and sour cream, it is awesome for cooling spicy food, high in protein, low in sodium and high in calcium-just make sure to select a yogurt that is low in calories and sugar!